On the day specified by the Constitution of the European Federation all member states joining EF will lose their sovereignty, and EF will become a state on its own. On the same date, all national constitutions of the former Eurozone member states’ will be replaced by new constitutions, in which their statehood will be changed to being a member of the EF. It will be a momentous event unprecedented in modern history. There is of course a possibility that some member-states of the Eurozone will not ratify the EF Constitution. These members will move to the EF Convergence Area (EFCA) zone, although they would probably be able to keep the Euro currency as a ‘shadow currency’, as it is now used in Kosovo and Montenegro. Since no new members will be admitted to the Eurozone after the completion of the ratification process for creation of the EF, the Eurozone will cease to exist. The EF will be the ever expanding core of the federal Europe, making the non-federated part of the EU progressively smaller. To sum up, although there are many other problems that would surface out during the transition, and after it has been completed, I would draw a conclusion that converting the Eurozone, into the European Federation in the next 5-6 years is definitely feasible and this might be the preferred option reducing many risks (this option would not include all members of the EU joining at the same time, but just the Eurozone members). That would mean the Eurozone would cease to exist and any new member aspiring to join the Euro area would instead have to join one of the subsidiary zones of the EF first. There would be no other option. The future EF would have to take into account the impact of accepting new members for the cohesion of the Federation as its foremost duty. Only the candidates, who would pass ‘the cohesion test’, would be allowed to start negotiation on accession to the EF. The cohesion criteria for acceptance would be, as now, the legal framework and actual practice of enforcing the Universal Values of Humanity in the candidate country. The second one, as mentioned earlier, would be the cultural similarity with the current members of the EU. The religion practiced overwhelmingly in the candidate country would be a particularly difficult and controversial subject. Therefore, some Muslim countries, such as Saudi Arabia or Iran (yes we have to think 20-30 years ahead) would probably have little chance to become full members of the EF in the foreseeable future. However, the EF will enable special association membership with wider scope of privileges and obligations than at present for those members who would not pass the cohesion test. Turkey, Georgia, Lebanon, Ukraine are among about 30 countries that currently have such an agreement. 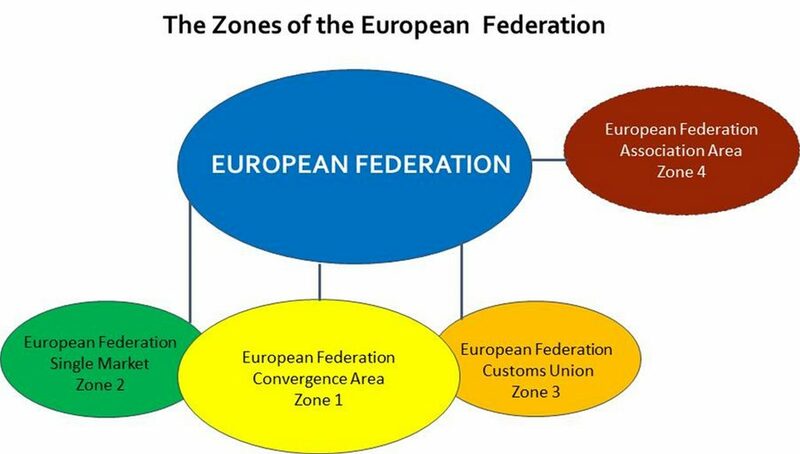 Should the association criteria become more rigid, as there should be, some countries like Turkey, may not qualify to be associate members of the EF Customs Union and may be relegated to join Zone 4 – The European Federation Association Area (EFAA). According with the proposed Constitution, the EF will have four subsidiary zones, which will also come into operation on the first day of the EF operation. Zone 1 is a member of both Single Market and Customs Unions. Members who are both in the Single Market (Zone 2) and Customs Union (Zone 3) do not necessarily have to move into Zone 1. Some members in Zone 4 could also be members of Zone 3 (Customs Union), like Turkey is now. The setting up of Zone 1 may start in parallel to the transition of the Eurozone into the EF. There will be no separate constitution for the EFCA. Instead, the EF constitution will cover the rights and obligations of the EFCA members, which in principle should become federated with the EF within 5 years. The rights of accepting new members, suspending, or expelling members will be the sole privilege of the EF. EFCA members will have the right to sit in the EF Parliament but will not be have the same voting rights as the EF’s MPs. Such a setup might initially create some tensions between the EF and EFCA. Tensions may arise because of the perceived benefits of the membership of the EF, not available to the EFCA member states. But that could only increase the motivation of the EFCA members to join the EF. The greatest benefit from this setup would be to show the EFCA members that the EF works and any problems it might have could be overcome. This is an optimistic assumption, I agree. It could also create some additional risks that are not present right now, and which might occur because of the changed political situation in the member countries of the EFCA. But at the same time, federalization of the Eurozone into EF and creating a separate EFCA zone for the remaining members could eliminate many more risks that threaten the unity of the EU today, like the looming Euro crisis, or different agenda in foreign policy, etc. Therefore, the EU would have to take up such a risk. Respect for the rulings of the European Constitutional Court and the European Court of Justice. Each member’s constitution will have to be approved by the European Constitutional Court for its adherence to the EF values. Electoral system for the EFCA. This will be the same as for the EF, i.e. Proportional representation system in place to select candidates. The Two Rounds System (TRS) ensuring that each candidate gets at least 50% of votes plus 1. However, the EFCA MPs may not have the right to vote on all EF matters. Electoral systems within the EFCA nations. As long as the EF Constitutional Court accepts them as ‘democratic’ voting systems, it should be up to those countries, which system they select, since the voting system should suit a particular cultural and ethnic composition of a given country. President of the EF is the Head of EFCA. He represents EFCA to external organizations, and chairs some of the meetings of the EFCA. Foreign affairs area. The EFCA members relinquish their rights to carry out their foreign policy, which is carried out by the EF Foreign Minister on behalf of all EFCA members. Defence area. This area would no longer be a competency of a member state joining the EFCA. However, over the first year, the member state’s Defence Minister will be an advisor on the former member state’s defence policy. Single Market. All members benefit from a single market for all goods, services and capital as well as to freedom of movement, settlement, setting up businesses etc. for all citizens of the EFCA. However, there are differences to the entitlements and benefits, such as unemployment benefit level. Fiscal policy and common budget. The EFCA members will send 5% of their budget to be managed by the EF central budget, from which some common EF projects will be financed, including projects in the contributing country. Opt-outs. There are no opt-outs allowed of any agreed policy of the EFCA in this zone. EFCA Enlargement principles. The accession of new member candidates to the EF, or a suspension or expelling of the existing member states will be the sole prerogative of the EF. The setting up of this Zone may start in parallel to the transition of the Eurozone into the EF. This zone will have its own Treaty, modelled on the cut-down version of the Lisbon Treaty. I will not cover the details of this Treaty, but rather focus on the differences between the EFCA (Zone 2) and EFSM. As you will see a lot of the principles of EFCA will stay the same, but some will be quite significantly changed. This is why I believe this Zone will be an ideal escape route for Britain. A written constitution. Every member state of the EFSM must have a written constitution. Countries that do not have it yet, will be granted some time to introduce the necessary jurisdiction. Respect for the rulings of the European Constitutional Court and the European Court of Justice. Each member’s constitution will have to be approved by the European Constitutional Court for its adherence to the Federation’s values. EFSM Assembly. It consists of one chamber: the Chamber of citizens’ representatives from individual states. The parliament term is five years. Candidates are elected for a maximum of two terms. Electoral systems within the EFSM nations. As long as the EF’s Constitutional Court accepts them as ‘democratic’ voting systems, it should be up to those countries, which system they select, since the voting system should suit a particular cultural and ethnic composition of a given country. Multi–party system. People can organize themselves into parties within EFSM states or across the whole EFSM. Electoral system for the EFSM. Proportional representation system in place to select candidates. Two Rounds System (TRS) ensuring that each candidate gets at least 50% of the votes plus 1. EFSM President. He represents EFSM and heads the EFSM Commission. He is elected for a fixed 5-year term and can serve a maximum of two terms. The EFSM Commission. This replaces the former EU Commission. It is headed by the EFSM President (there is no separate Prime Minister). However, all Commissioners are now Ministers, who are experts selected from a common EFSM pool of experts. Foreign affairs area. The EFSM members do not have their joint Foreign Policy Minister and they can carry out their foreign policy independently, being closely harmonized with the EF. Defence area. This area will be co-ordinated but not ruled by the EF Defence Minister. Each country will retain its own Defence Minister. This may change rapidly depending on political situation. Fiscal policy and common budget. All members pay 2% of their budget into the EF budget to help finance joint projects. The EFSM will try to harmonize its long-term economic and fiscal policies but there will be no interference into setting the member state’s budget or fiscal policies. Single Market. All members benefit from a single market for all goods, services and capital as well as to freedom of movement, settlement, setting up businesses etc. for all citizens of the EFSM. However, there are differences to the entitlements and benefits in EFSM countries, such as unemployment benefit level. Energy policy. The EFSM co-ordinates the energy policy with the EF, especially in the area of common energy supplies. Opt-outs. Members may declare up to 5 opt-outs of any policy of the EFSM unless it violates the principles of the EFSM Treaty. The ultimate arbiter will be the EF Court of Justice. Lobbying. There is an extensive e-democracy system operating across the Federation enabling lobbying on new legislation or changes to the existing law by petitioning the Federation’s Institutions. The creation of the EFSM zone would open new possibilities for countries staying close to the current EU, but being formally outside this organization. The first such potential candidates are the current EFTA countries, i.e. Norway, Switzerland, Iceland and Lichtenstein, which are also members of the European Economic Area (EEA) and full members of the current EU cohesion programme. What’s important about these countries is that their economic performance is on par with top EU economies, similar foreign affairs policy (i.e. towards Russia or China), similar judicial institutions (EFTA Court), similar democratic principles and economic policies and the system of human values nearly identical to those of the EU. If these countries were participating in the creation of the EFSM zone, including possibly the United Kingdom, then Europe would have become better integrated with fewer tension spots and increased economic and social benefits. The key attraction for these countries would be the increased security and economic influence they could exert as members of a much larger organization. Even if only these additional countries were added, the combined GDP of such an enlarged EU would be about 1/3 of the global GDP, with the population exceeding 700m and being one of the four military superpowers. That would allow the EF to execute most of the functions that it would need to start reducing the existential risks of Humanity. There would be other advantages for these countries. The first one is that Switzerland, which has over 200 separate Agreements with the EU, could join by signing just one Agreement and have a serious of opt-outs instead. Principles and values. The joining members will have to accept that they will strive to modify their political system to respect the Universal Values of Humanity. Accession, suspension and expelling of EFCU member state is the sole power of the EF Government. Trading relations with the EF. All member states of the EFCU benefit from tariff free trade and unrestricted movement of goods across the EF and its Zones 1,2 and 3. Trading relationship with non–EF countries. No EFCU member state can enter into trading relationship with a non-EF country without a prior agreement with the EF government. Contributions to the EF budget. All members pay 1% of their budget into the EF budget to help finance joint projects. Single Market. The EFCU members do not have access to Single Market. Opt-outs. Members may declare opt-outs of any agreed policy of the EFCU unless it violates the principles of the EFCU Treaty. The ultimate arbiter will be the European Court of Justice. The creation of the EFCU will streamline current Customs Union agreements and bring those countries closer to the EF, opening a possible path to joining the EF Single Market zone at some stage. The setting up of this Zone may start, similarly as Zone 3, in parallel to the transition of the Eurozone into the EF. This zone will have its own Treaty, modelled either on the current Association Agreement, or on the Comprehensive Economic and Trade Agreement (CETA) concluded between the EU and Canada in 2017. I will not cover the detail of this Treaty, but rather focus on the differences between the EFSM (Zone 2) and EFAA. The EFAA will include all current countries that have Association Agreements with the European Union. These countries will have to accept some general conditions, such as those in CETA. Otherwise, the conditions will be specific for a given member, mutually agreed with the EF. Any candidate for the EFSM zone, like Moldova or Kazakhstan, will have to be a member of this zone first. Only upon meeting all the terms of the accession will they be able to join the EFAA zone. Principles and values. The joining members will have to strive to implement the Universal Values of Humanity, although they can get an exemption during the negotiation for some cultural or religious differences. Respect for the rulings of the European Court of Justice. Each member will have to accept the verdict of the ECJ in any aspects of its relationship with the EF. Trading relationship with non–EF countries. An EFAA member state can enter into trading relationship with a non-EF country without a prior agreement with the EF, unless it is also a member of the EF Customs Union. Fiscal policy and common budget. Members could voluntarily apply some fiscal policies of the EF. Each country uses its own currency. However, members may use Euro currency as a shadowing currency, taking of course all the risks that such a policy involves. Opt-outs. Members may declare opt-outs of any agreed policy of the EFAA unless it violates the principles of the EFAA Treaty. The ultimate arbiter will be the European Court of Justice. By creating EFAA, the Federation would have the means to create much closer direct relationships with probably half of the countries in the world, addressing the needs and aspiration of hundreds of millions of people world-wide. This would make an additional natural pull for other countries wanting to join the Federation, important if it wants to act as a de facto World Government. The reach of the Federation into other continents will at the same time help spread and re-enforce Universal Values of Humanity in many more countries.